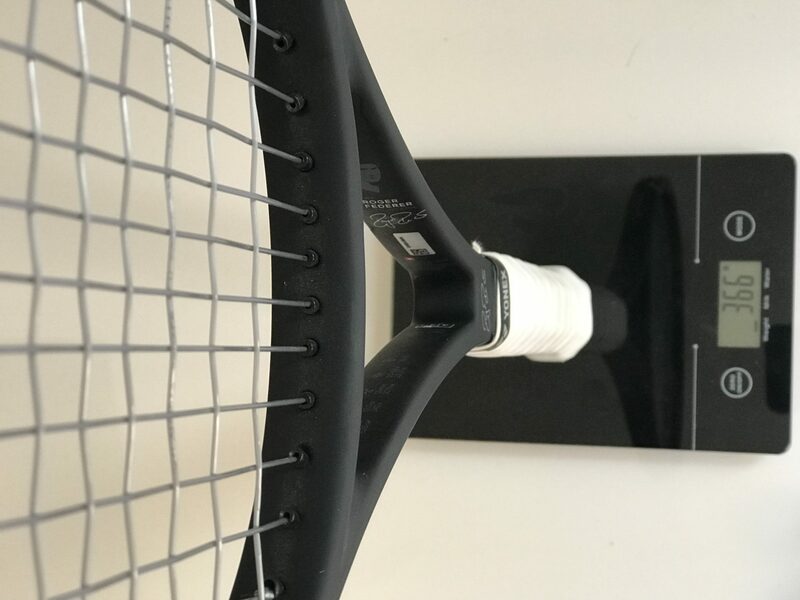 I’ve already written a Wilson Pro Staff RF97 Autograph review, but after playing more with this racquet now and testing it for the third time, I thought it was time to do it again. This time also with a video review. 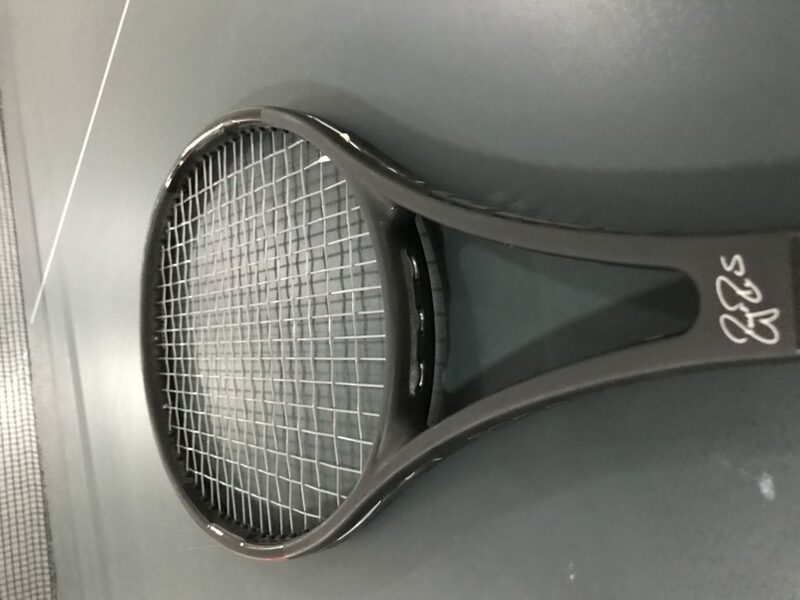 My Wilson Pro Staff RF97 Autograph review might seem to come out of the blue, but the reason I picked up the racquet again is that I wanted to compare it to the Yonex VCORE Pro 97 330 , that I’ve written my first impressions about here. The Wilson Pro Staff RF97 Autograph (RF97A) is Roger Federer’s racquet of choice (his face is on the beam even!) and one of Wilson’s biggest bestsellers of all time. This is quite remarkable considering the weight of the RF97A making it a very difficult racquet to use. It’s definitely a racquet that requires solid technique and footwork. It’s also a very stiff frame that might not be the best friend of sensible elbows and arms. Below are the specs of the RF97A racquet. As you can see the Wilson Pro Staff RF97 Autograph is not a racquet for intermediate players. You need to have advanced mechanics and footwork to reap the benefits of this stick. But if you have that and the strength to weild it efficiently, it can be a close to “magical” racquet. It definitely rewards you when you’re on your game. The RF97A simply brings out the best and worst in your game. Sometimes you feel like Roger Federer and other times the racquet might make you feel more sluggish than normal. I could definitely see what it does to Federer’s game and when I’m in good form and playing well, it also does wonder for mine. On the other hand, when I’m half-step slow, it’s tougher to get the racquet around and connect with the ball properly on certain shots. On the slice it feels heavenly, but on forehand approach shots when you need to “dig up the ball”, it’s not the easiest racquet to use and whip around. I’ve played quite a bit with the Wilson Pro Staff RF97 Autograph lately and I’ve had some really good results with it. I haven’t been bothered at all by the stiffness (which used to be an issue for me) despite having the racquet strung with a full bed of Luxilon Alu Power (Roger Federer uses Wilson’s Champions Choice , a hybrid with Alu Power Rough and natural gut ). I don’t know if having an extra heavy spec (366 grams, like Federer’s batch) of the RF97 Autograph helps to protect my arm (heavier racquets generally helps, except for when it comes to your shoulder), but it sure feels more comfortable than I remember it. And on the backhand wing where I’ve struggled a bit with the VCORE Pro 97 330, it feels just sublime to have that stability. This is not a racquet where you hang out on the baseline during a clay court match. You need to play a bit like Federer, go for shorter points and play more aggressive tennis. Then it works just like a dream. It’s going to be pretty tough to whip up tons of topspin so a flatter, attacking style tennis is recommended. The RF97A is as stable as a racquet gets and if you can get it moving, you can hit some pretty solid volley winners. For a stiff racquet it has a really nice feel to it so drop volleys and touch shots are encouraged. Same here – get it moving and you will benefit. This racquet packs a punch for the worthy player. I’m impressed with how controlled this frame feels despite being stiff and heavy. The string pattern is just open enough to give some extra spin, but there are not hot spots in the string bed or other things that may cause inconsistency. 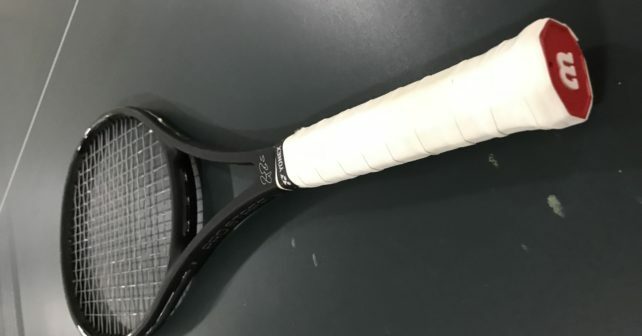 This is a stiff and heavy racquet that requires the proper technique and conditioning to play it. If you have arm issues I’d frankly stay away from it. I don’t have any issues with tennis elbow and are so far not suffering from it either while using the RF97A. But it is string sensitive so try to opt for a slightly softer setup. This is a heavy stick! And it’s not a 90 sq inch mid-size racquet like Federer’s old Pro Staff 90 so it doesn’t move very easy through the air. Thankfully, the balance is quite headlight so it moves a little bit faster than you would think. But definitely not a racquet for everyone. This racquet generates decent spin with sacrificing control. I think they’ve found a good level of control, power and spin for this racquet. For being a players “club” that is stiff and heavy, this racquet feels remarkably good on touch shots and the heft of it makes it relatively easy to hit a nice dropper. This racquet is close to as good as it gets for the right player. A strong, attacking player with proper technique can really benefit from playing with the RF97A. And it’s a fun hit also for somewhat lesser players, if you just want to try to channel Roger Federer’s spirit for a while. To summarize: top notch stick from Wilson and Roger. But definitely not a Pure Drive in terms of playability for a wide group of players. Have you ever played with Wilson Pro Staff RF97 Autograph? What did you think of it? Please comment below. Grip the racquet too tight* and/or wrong grip size are main ingredients for elbow/wrist injuries. *trying to stabilize(or adapt to) racquet. Also, grip too loose to generate power with hands/forearm instead of body. Tennis is a sports that senses(perception) need to be in harmony to improve your game/technique. So how does the RF97a compare to the Yonex VCORE 97 330? Wow, that’s enough content for a long post (coming soon). RF97 is more powerful and stable. VCORE PRO is more manoeuvrable and comfortable. Need to test a new string in the VCORE Pro to give you an even better idea. But a post comparing these racquets will be live this week. What is the strong tension that you play with? I always string around 23-22 kg. I could go lower, but not higher. I agree! You got to keep a relaxed swing and not arm your shots. Using your full body is key to playing decent tennis. I think both Rafa and Federer are examples of letting aerodynamics do the work and not the arm. I personally experienced comparison RF97 between pro room and retail version with same string set up. The difference was quite obvious in term of feel and stability. couple of my friends blindly test them and also noticed the difference. The retail version vibrated when the ball touch the string bed while pro room version is quite stable. Pro room version feel softer and reported stiffness was just 64 comparing to 68 of retail. I presume the Pro room version may not contain Aramid. As you played a long year with six one 95. how does it compare to this RF97A. I used to play only with prostaff classic 95 which I found they are quite similar in solid feel and weak point of manoeuvrability. Manoeuvrability is also the reason I decided to pick prostaff 95 18 mm to add swing wt and static wt to obtain about 355 g strung wt. and I like it through it’s still have less power than RF97A. I am a flat hitter sometime too much power also hurt me. I am interested in six one 95 because there is pro room version that stiffness lower at 62 and static wt can be set in my comfort zone of 35x. how do you think. I think the manoeuvrability of the Six One 95 is quite good. It’s very head light and the smaller racquet head makes it swing faster through the air. I don’t think the stiffness is particularly bothersome either and it all depends on which version of the Six One 95 you choose. At home now I have 2 Wilson Six One nCode 95 16×18 (65 RA so softer), two 2014 Six One 95 BLX 18×20 and the most recent paint job in white/red (2018) of the 2014 version. I have strung the 2018 up with Luxilon Alu Power at 23 kg and I think they play quite comfortable with a good mix of power and control. I have always enjoyed the Six One 95 series and believe there is a reason so many professional players use it on tour. I’m sure the pro room version with 62 RA is nice too, but it’s all up to preference. For example the nCode is as soft as I need them personally and I’m not bothered by the stiffness of the recent version either. And I know some pro’s like the Hyper Pro Staff 6.1 or kFactor which is a stiffness of high 60s. Good luck on finding a good racquet for you! Thank for your insight comment.Jonas. I love this racquet. I’m only a 4.0 player and have never even considered all the metrics to selecting the proper racquet for my game, but I know what feels right. Good control on volleys and is easy to take the pace off of hard balls. It doesn’t feel as heavy as it is and I have experienced no negatives. I play for 3-4 hours at a time and it feels great. How stiff is this version compared to previous red and black version?. And if it is good, please suggest recommend tension and string. Please suggest heavy racquet with low stiffness. ProKennex offers some 325 gram unstrung flexible sticks that are nice. Hi Jonas. I’ve been mostly playing with a kfactor six one 95 16×18 for a lot of years now and have been thinking whether I might benefit from having a slightly larger headsize for a larger sweetspot. How does the RF97 autograph compare? They have very similar weight and balance specs, but was wondering how differently they played. Thank you very much and keep up the great work! awesome webweite and Hi from Germany. i was playing a while with an old Wilson Staff 450 ST (high beam) and played a lot of Racket for trial since a coupe of month. i bought a Wilson RF 97 Autograph now cause it feels like a crazy piece of racket and this wow effect. i could get it fairly unused for 100eur. But as i do have problems with arm and elbow iam looking for a second lighter one to give my arm some rest some day. Might the 315g countervail version would be a good alternative racket? thanks for any advice and keep up the good work. Thanks and welcome to the beautiful sport of tennis! The RF97 Autograph is quite some racquet to start playing tennis with, it is both stiff and heavy so beware of getting elbow/wrist issues. The 315 version is a good alternative, but if you like the Blade, go for that one. The Blade is stable enough to be used by advanced players in stock form so the weight should be enough for you. The Blade has more weight in the racquet head than the Pro Staff 97 CV, which is why it will still play stable. I would string it with a soft poly string such as Luxilon 4G Soft or Alu Power soft. Good luck and put your arm health first and focus on developing good stroke mechanics and foot work! Thanks so much for the quick reply and sorry for some misspellings i didn’t notice. ok i might test the 97CV version cause i have never played it..
Also you mentioned in your video like the RF97 is made for federer does it also means you would not recommend it for one with a two handed backhand? i like to play a lot of slice though..
What do you think of the countervail material in general? does it makes sense to have two so different rackets like RF97 Autograph and the blade? or better 97 CV cause its more similar? I think you should try to use a softer string in the mains and a poly in the crosses. Like Wilson NXT mains and Alu Power in the crosses. Countervail seems to work well in some racquets and less good in others. The Blade 98 CV is not my favorite compared to other Blades, but the Ultra 95 CV felt pretty good to me. I think it would be a good idea to choose one racquet and get two of that one so you can always play with the same setup. This would help your game improve the fastest. And I would recommend a lighter racquet than the RF97A. The Pro Staff 97 CV could be a good option.